We have been raising fish since 1986. 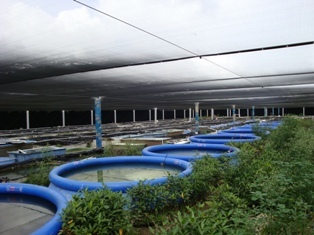 Our fish grow in vats and above- ground ponds. Our facilities are all under screen or plastic- allowing us to better protect the fish from the elements. Shipments are prepared upon request. We ship with airlines from MIA or FLL to your preferred destination. Enrique Schmalbach, the owner and founder of the company has extensive knowledge and experience in raising fish and shrimps. We regard our customers with utmost respect. As the ad goes- we will not sell you a fish - we would not buy ourselves...We offer services rain or shine- and expect our customers to be honest and fish loving. To enhance your satisfaction we will also give you free consulting on issues related to our stock. Please, enjoy the fish - and buy again!